The official Nexus 4 Android 4.2.2 JDQ39 OTA software update seems to have been rolling out slowly to all the Nexus 4 devices — along with the other Google Nexus devices. Like always, Google has not published a complete change log of the Android 4.2.2 OTA update, which means, so far we are only assuming this minor update will fix the Bluetooth bug. The exact Android 4.2.2 build is JDQ39 for Nexus 4. You can manually update Nexus 4 to Android 4.2.2 JDQ39 OTA software update from the tutorial below — and root Nexus 4 on Android 4.2.2. Your Nexus 4 should already be on Android 4.2.1 JOP40D firmware in order to install this OTA. 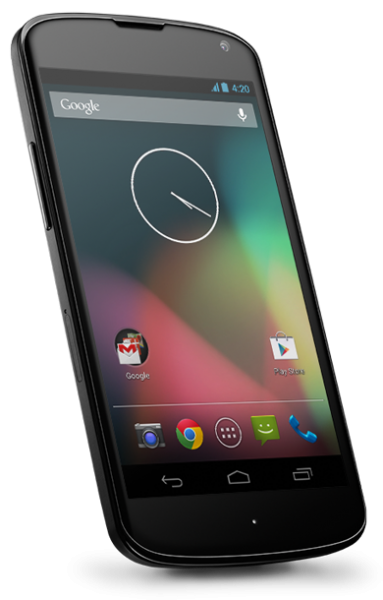 As you read further, we will guide you how to install Android 4.2.2 JDQ39 Jelly Bean software update on Nexus 4 with complete steps and instructions, how to backup your important data, some other important tips. In case you have problems connecting your phone with the computer, make sure USB drivers are properly installed and read the tips below. Remember, this is an official OTA software update by Google, not a custom ROM. Let’s get on with the tutorial now. Android 4.2.2 JDQ39 OTA update has just been released for the Nexus 4 and Nexus 10. Samsung Galaxy Nexus Android 4.2.2 software update will be out very soon as well. There have been no features added. This is just a small bug fix OTA update. UPDATE: Android 4.3 JWR66V Jelly Bean for the Nexus 4 is now available. Read here! If you plan on rooting this phone or are still confused for why to root Nexus 4, read: Benefits of Rooting Your Android Device. Download LG Nexus 4 USB drivers! Backup your Apps. How? –> How to Backup Android Apps. Backup your SMS messages. How? –> How to Backup/Restore SMS Messages. Backup Contacts, Gmail and Google Data. How? –> Sync with Google Sync. Backup Call History. How? –> How to Backup Call History. Backup WhatsApp Messages. How? –> How to Backup/Restore WhatsApp Messages. Backup APN Settings: GPRS, 3G, MMS Settings. How? Note down everything from: Settings > Wireless & Networks (More…) > Mobile networks > Access Point Names. If you already have a custom recovery (ClockworkMod, TWRP etc.) installed on your phone, we strongly recommend a backup using that as it creates a complete image of your existing phone set up. 1. Having problems connecting your Android phone to the computer? You need to enable USB debugging mode. See here: How to Enable USB Debugging — for Gingerbread, Ice Cream Sandwich and Jelly Bean. 2. Make sure your Android device is charged up to 80-85% battery level. This might help you: How to Check Battery Percentage. Why? Because, if your phone goes off suddenly while installing a custom ROM, flashing an official firmware update or installing mods etc. — your phone might get bricked or go dead permanently. No one wants that, right? 4. Most of the tutorials and how-to guides on Team Android are for factory unlocked Android phones and tablets. We recommend not to try our guides if your phone is locked to a carrier, unless we have specified the carrier name or device model. If you find the above tips useful and they were helpful to you, please consider giving us a +1 or LIKE to thank us! All set and ready? Good. You can now continue reading below and update your Nexus 4 to Android 4.2.2 software update. If you have a rooted Nexus 4, head over to the next page directly for the complete tutorial. We have put together a detailed step-by-step instructions guide on how to install the official Android 4.2.2 Jelly Bean OTA software update (JDQ39) on Nexus 4. This tutorial is for beginners who are not used to install software updates manually. Please make sure your phone fulfills all the requirements and you read the entire tutorial once before actually performing it on your device. Disclaimer: Try this on your own risk. I’m not responsible if you mess up with your Nexus 4. This tutorial is only for Nexus 4 and I am not sure if it will work on the other variants of the Nexus 4 on other carriers. Your phone needs to be on Android 4.2 JOP40C (previous official update) which is NOT rooted and has stock recovery. Do not proceed if you don’t have Android 4.2 JOP40C installed. Step 1 – Download Android 4.2.2 (de8b8d101614.signed-occam-JDQ39-from-JOP40D.de8b8d10.zip) for Nexus 4 on your PC, if you haven’t already. Rename it to update.zip. Step 2 – Connect and mount your Nexus 4 USB memory on your computer using the USB cable. Step 3 – Now copy/paste the update.zip file to your SD card. Make sure the file is in the root (not in any folders). Step 4 – Then turn OFF your phone. Step 5 – Now to get in the Bootloader Mode. Turn ON the phone while pressing and holding the Volume Up + Volume Down + Power buttons till you see the Fastboot menu and START on top. Step 6 – Follow the navigation instructions on the screen. Press Volume Up button several times till you see RECOVERY and press Power button to select it. Step 7 – You will get an exclamation mark now. Again hold your Volume Up + Power buttons. You should now see the Recovery Mode menu. Step 8 – Select update from SD card. Now select update.zip file and select it with the Power button. Installation should start now. Step 9 – After the installation completes, the phone will boot now and it might take about 5 minutes to boot on your first time. So, please wait. That’s it! Your Nexus 4 should have the official Android 4.2.2 JDQ39 Jelly Bean software update installed on your phone! Go to Settings >About phone to verify. UPDATE: You can now also root Nexus 4 on Android 4.2.2 JDQ39 firmware. Read the complete tutorial here! Hit +1 or LIKE to thank us! You Nexus 4 is rooted? Then go to the next page for the complete tutorial on how to install this Android 4.2.2 JDQ39 OTA update on an already rooted Nexus 4.